If you are not familiar with Oblique Projection, start by reading our article 3D Drawing. Here is another view of the multilink structure discussed in 3D Drawing. Draw it in Oblique Projection - you may find using squared paper helpful. Now try drawing it again, this time with a different face as the front. What do you think the advantages of Oblique Projection are? What disadvantages are there with this method of representing 3D objects in 2D? Technology. STEM - design technology. Maths Supporting SET. Investigations. Practical Activity. Design. Visualising. 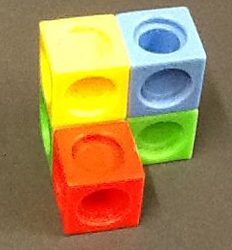 Cubes & cuboids. Nets. 2D representations of 3D shapes.